According to various sources, changes are going to be made to the Disney security processes in the coming months. This change is expected to begin with the theme parks and then continue on to the resorts in a slightly different way. 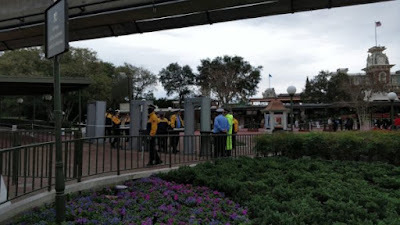 According to chipandco.com the following picture was taken recently of security cast members being, "trained" on new metal detectors. While it has been expected that every guest will in fact be required to pass through metal detectors in the future, the new devices would in fact point to that conclusion in many ways. The process is already currently in place at certain times of day at all of Disney's Florida theme parks. We do not know for sure that this is why the new detectors have popped up. Also, as an addition to what is expected to be debuting quite soon, these metal detectors are supposed to be added to the Transportation and Ticket Center in order to alleviate large crowds and backups entering the Magic Kingdom. Now, here's where the report turns more to speculation. According to various groups across the internet, as well as the above mentioned source, it is believed that security will be stepped up quite a bit at all of the Disney parks, but potentially also at the Disney resorts. At the resorts, guests would be required to scan luggage upon check-in. This practice already occurs over seas at some of the Disney properties, but I believe it would be a first for the United States resorts. Again, this is simply speculation with the exception of Security Training at the Magic Kingdom. Disney has yet to announce any formal changes coming to the security process. At this point there are very few details about the potential for these new systems in the future. However, Disneyland's new security system is going into affect in the next few days. Their design will be scanning guests before they enter the general area of the entire Disneyland area. All we know for a fact right now is that security is trying new things outside of Magic Kingdom's gates, there is construction for new security by the exit of the ferry boats near Magic Kingdom, and Disney is working to manage the crowds more effectively in the future. Our purpose in writing this article is to help inform those planning vacations on what is going on in around the parks, not to spread rumors. Hopefully, this can help those planning ways to manage their times in the parks and travel time necessary from park to park. Hopefully this helps you out in some way. Thanks for reading!